With a wild card, Montreal and Laval might have had a Vanier Cup rematch in 2014 when the title game was in Montreal. The mind reels. Now who has two thumbs and is demented enough to re-seed replay brackets for the last eight seasons? As an addendum to the post above, and as a working example, here are what the fields for a 'plus two' playoff structure would have looked like from 2008-15. It's some back-of-a-napkin stuff, since it's unclear how a Final 6 would be seeded, i.e., how is the weighting distributed between winning a trophy game and national ranking. Plus there's the question of whether to only use the last poll, or weigh the last 2-4 weeks. 2008: Very self-explanatory. Laval was head and shoulders above the ROC. Queen's and Western were OUA's best regular-season teams while Ottawa and Western proved to be OUA's best playoff teams. For the first of three years in a row, post-Blake Nill Saint Mary's and early-Nill Calgary were each in the final four. 2009: This is where it's worth talking about a need to use more than one poll. Queen's rose to No. 2 in the third-to-last poll after moving to 7-0 with a one-point home win against Western, which also clinched first in OUA and home-field advantage throughout the run up to the Vanier. Following a loss to Laurier in a nothing game, voters bumped them to No. 4. The prologue was the end of the '08 regular season, when they had key injuries during the regular-season finale..
Based on the last poll, Queen's would have been the third seed. In hindsight, they should have remained in the 2-hole for the final poll. For point of comparison, this is what we get using the antepenultimate poll of the regular season. 2010: The real Vanier, in hindsight, was Laval's last-minute 13-11 escape against Western on a cold, windy day in the Uteck Bowl. Our retcon also shows they should have been the first and second seeds. Greg Marshall's Mustangs really didn't get a fair shake by being sent to Laval for the semifinal. By the same token, would it have been different for Calgary and fifth-year Erik Glavic if they had started their eastern odyssey with a semifinal in London, Ont., instead of at Laval, where they were shut down 29-2 in a snow squall? 2011: The 2011 Vanier was a commercial, competitive and critical success, with Mac shading Laval 41-38 in overtime in front of a neutral-site, but engaged crowd at B.C. Place. It was clear that those were the two best teams. The bowl rotation put both on the road for the semis, though. Top-ranked Laval had the tougher draw, Calgary (which it beat 41-10). The No. 4 Marauders got the easier draw against Acadia (which it beat 45-21, after spotting the Axemen an early two-TD lead). Please explain why that was just. The Marauders had a drag on their ranking due to a perfect storm of humid early-season games, injuries, and an early trip to Western. Yet if we're going to be strict, then they have to be No. 3. The 2012 Marauders crushed Calgary by 39 points, so presumably they could have handled them on the road in '11. Acadia (No. 9, 61 points, AUS champion) would rate being ahead of wild-card Montreal (No. 7, 97 points). The replay bracket makes Montreal a potential semifinal opponent for the Marauders instead of Calgary, who got drilled 45-6. In the final 2012 poll, Guelph received 167 points to garner the No. 5 spot and Regina got 138 to finish No. 7. One could see a place where there could be a criteria that ensures the poll-based wild cards do not always go to OUA and RSEQ runners-up. Neither Guelph nor Regina stacks up as a particularly strong second wild card. 2013: The Big Three conferences all had a Clobbersaurus who basically ran the table, while Mount Allison went on the road to win the Loney Bowl. There was a cutesy tableau when Mount A hosted the Uteck against Laval, which made for pretty pictures on TV, but the game was over in the first quarter and I went for a jog and so I could be cooled down in time for the Mitchell. What might have been is that No. 1 Western would have hosted the Mitchell instead of travelling for it, where they got tuned 44-3 against Calgary. Laval would have also hosted the Uteck. The quarters are Mount A-Calgary and Montreal-Queen's. 2014: You might remember that in the final regular-season poll, Laval was No. 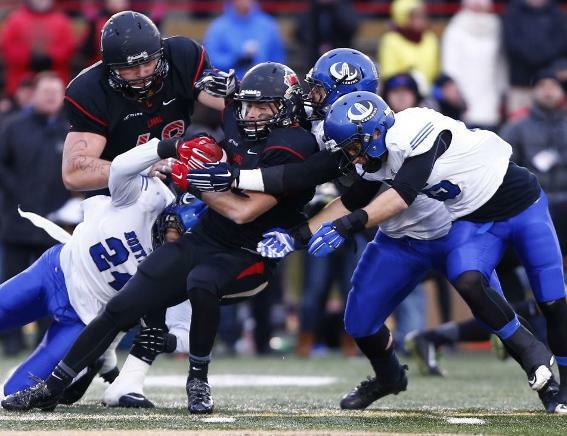 1 but the Carabins had a 12-8 edge in first-place votes. The Dunsmore Cup was also a 12-9 field-goal affray. Laval draws in at No. 3. Mount A probably was the best AUS team since the advent of the age cap, and would rate hosting a quarter-final. The working criteria that a wild card has to be lower than their conference's champion relegates Calgary to No. 6. Calgary at Laval in a quarter-final would have been very compelling viewing. There could have also been potential for a Laval-Montreal matchup at the 50th Vanier Cup, in Montreal, which would have been (consults urban dictionary) moff. 2015: Last season was the year of road teams in conference finals. Based on the final poll, Calgary and Western would cut out third-ranked Laval. One takeaway. The more upsets there are in the conference finals, the better the matchups get later. In 2011, Mac lost to Western at home in Week 2 and then endured starting pivot Kyle Quinlan being suspended for their next three games after that for being arrested.